To be more precise, then-Representative Edwards made quite a few promises while campaigning throughout the state in 2013, 2014 and 2015. Among the most frequently and conspicuously violated of such promises must surely be his pledge to reform government so that taxes would not have to be raised. In his record ten legislative sessions over the last three years, he instead raised taxes by $7,000,000,000 (yes, that’s what the actual number looks like), and there has not been a single serious attempt to reform our bloated government in all that time! 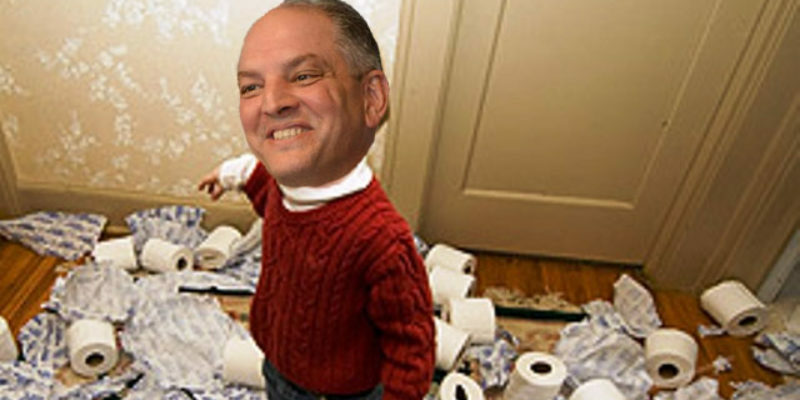 We quickly reach the inescapable conclusion that the people of Louisiana have been duped, all the more so as John Bel Edwards knew perfectly well at the time that he was making his promises, that his first act would be to greatly expand the Medicaid rolls. The number of Medicaid recipients added to the government dole by Edwards’ expansion will soon exceed half a million people, while the Louisiana Department of Health & Hospitals remains unreformed and horribly administered by incompetent ideologues. Fact is, this department’s gaping maw will by itself consume an additional half billion dollars a year into the foreseeable future and that’s only if nothing else bad happens, such as a federal pull-back in Medicaid payments or an accelerated collapse of the private healthcare market. Unfortunately, it is merely a question of when, not if, the percentage of Medicaid paid by the federal government is reduced, as the favorable initial terms or the federal/state arrangement were designed to lure the state into the program. The leaves of this bureaucratic Venus fly trap will snap shut soon enough, as one of the conspirators who concocted the scheme so publicly bragged. We can only wait and see whether the private healthcare market collapses before the federal government begins pulling back on Medicaid payments. Either development will bankrupt Louisiana within a year or so. So no one should believe for a moment that Louisiana’s fiscal problems have been solved; rather, they have been institutionalized far into the future. The Governor’s claim to have balanced the budget is blatantly false. The reality is that the state’s ongoing fiscal problems have been swept under the rug for precisely one year, which is – surprise, surprise! – this election year! Be assured that we will shortly be facing a fiscal deficit in late 2020 and every year thereafter. If re-elected, this governor will soon be repeating all his usual threats to close the hospitals, colleges, and nursing homes, while our roads, bridges, and other infrastructure continue to deteriorate. How can we know this? The answer is really quite simple – let us never forget that he is a Democrat, a fact curiously omitted from his campaign kick-off speech. Basically, John Bel Edwards has no other choice but to continue to threaten and bully fiscally conservative legislators into raising taxes and fees, which further diminishes our ability to attract new business or even sustain our existing ones. His party and his allies would never permit him to reform our bloated and dysfunctional government, even if he were of a mind to do so. So under this Governor there will be no check on rampant Medicaid and welfare fraud, and no attempt to reduce spending elsewhere in government; no attempt to revisit the hundreds of statutory dedications which confound our legislators; no attempt to ease the burden of government regulations on our businesses; no attempt at tort reform; and most certainly no attempt to reduce taxes. In his campaign kick-off video John Bel Edwards expressed keen satisfaction with his job performance, but the facts starkly contradict his self-congratulatory narrative. Under his administration Louisiana has lost population, underperformed in economic growth as compared to almost all other states, and dropped down to last in virtually every quality of life metric (job creation, health and longevity, retirement, education, crime, etc.). Four more years under his administration, or rather five counting the year remaining in his first term, would simply prolong an unnecessary nightmare. It is most assuredly time for a change! Louis Gurvich is Chairman of the Republican Party of Louisiana.